The Journey And The Labyrinth: The Music Of John Dowland, directed and produced by the Emmy-award winning team, Jim Gable and Ann Kim of Graying & Balding, Inc., delves deeper into Sting's relationship with the sixteenth century figure, who has captivated generations with his songs composed primarily for lute, which Sting tackles along with esteemed lutenist Edin Karamazov. Filmed appropriately at Lake House, Sting's 16-century manor house in Wiltshire, and in the ancient gardens of Il Palagio, his home in Italy, the DVD also features the performers before a live audience at St. Luke's Church in London. Interspersed between performances of such timeless Dowland songs such as "Can She Excuse My Wrongs," "Come Again," and "Flow My Tears," are discussions with musicologists David Pinto and Anthony Rooley of the composer's place in music history and his relevance today, plus recitations by Sting from Dowland's personal correspondence. In a rare live appearance performing Dowland's music, Sting and Karamazov's concert at St. Luke's Church in London was also captured as a live audio recording and serves as the bonus CD included in the package. Featuring selections from Labyrinth, the CD also contains the consummate hit "Message In A Bottle," arranged for lute, as well as a rendition of the Robert Johnson blues classic, "Hell Hound." The Journey And The Labyrinth: The Music Of John Dowland, directed and produced by the Emmy-award winning team, Jim Gable and Ann Kim of Graying & Balding, Inc., delves deeper into Sting's relationship with the sixteenth century figure, who has captivated generations with his songs composed primarily for lute, which Sting tackles along with esteemed lutenist Edin Karamazov. Filmed appropriately at Lake House, Sting's 16-century manor house in Wiltshire, and in the ancient gardens of Il Palagio, his home in Italy, the DVD also features the performers before a live audience at St. Luke's Church in London. Interspersed between performances of such timeless Dowland songs such as "Can She Excuse My Wrongs," "Come Again," and "Flow My Tears," are discussions with musicologists David Pinto and Anthony Rooley of the composer's place in music history and his relevance today, plus recitations by Sting from Dowland's personal correspondence. 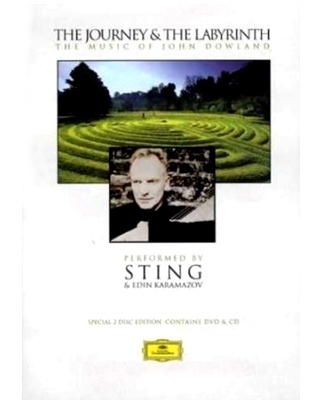 In a rare live appearance performing Dowland's music, Sting and Karamazov's concert at St. Luke's Church in London was also captured as a live audio recording and serves as the bonus CD included in the package. Featuring selections from Labyrinth, the CD also contains the consummate hit "Message In A Bottle," arranged for lute, as well as a rendition of the Robert Johnson blues classic, "Hell Hound."